Dunedin is a diverse and wonderful city. I had never lived in a city before I came to New Zealand, so I was both excited and a bit apprehensive about living in such a setting for the first time. I didn’t take long to realize that Dunedin has the best of both worlds, though. It has the convenience and resources of a city but is surrounded by stunning natural beauty. It also has some world famous places, like its train station and the chocolate factory, both of which are just a short ten-minute walk from the University that I attend here! Recently, my study abroad group enjoyed an afternoon escape to nature by taking a scenic round-trip train ride from the local station. 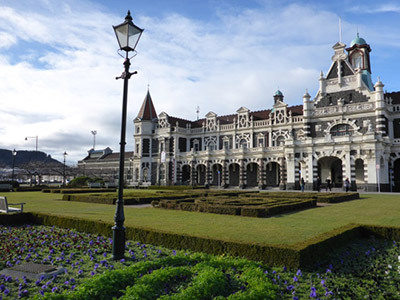 The Dunedin train station is the third most photographed building in the world and has the longest train runway in the world. 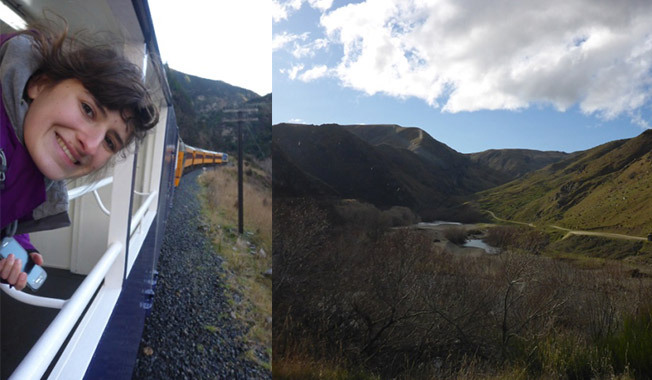 It also runs a world-renowned scenic train ride through the Taieri Gorge, which is where we went. 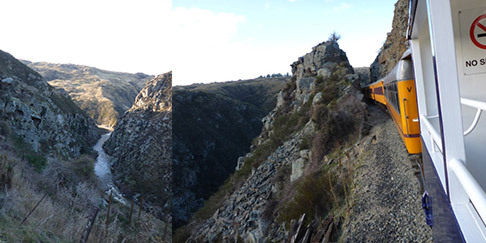 The train ride started by leaving Dunedin and going through some farmland, but the scenery just kept getting more and more dramatic as we entered the rocky gorge reminiscent of Lord of the Rings. 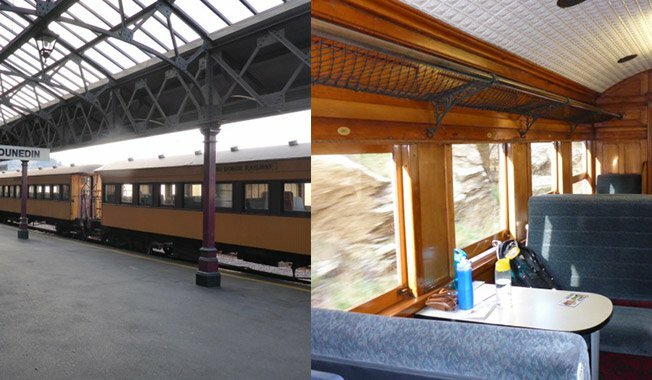 There were cars that we could stay in with semi-fancy woodwork and cosy seats, but we all walked to the open viewing cars in the front of the train to feel the wind in our hair and get uninterrupted views of the landscapes. 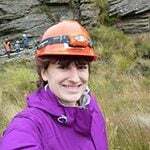 During the train ride, we made a few stops to stretch our legs and enjoy the spectacular scenery. 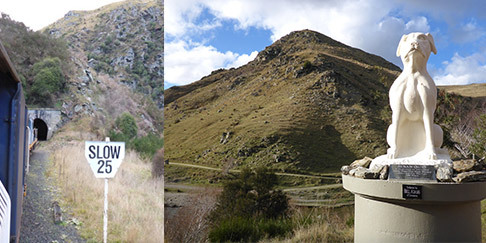 I knew that sheep farming was an iconic aspect of New Zealand, but I never expected to see a tribute to it on the side of train tracks in the middle of a gorge! 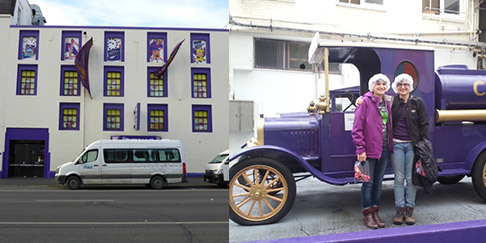 Right next to the world famous train station in Dunedin is a Cadbury Chocolate factory. It uses cane sugar from Australia and milk from New Zealand to make chocolate for countries worldwide! I’ve sampled quite a few of their products, like Black Forest milk chocolate (which has cherry jellies and biscuit pieces in it) and Pinky bars (pink marshmallow covered in caramel and chocolate). My sister and I had gone on a tour of their chocolate factory last month, and we got to see how and where the chocolate was made. The tour ended by watching the largest chocolate-fall (like a waterfall but with chocolate instead) in the world! Last week was their annual week-long Chocolate Carnival, which meant that a myriad of chocolate-themed activities was occurring. 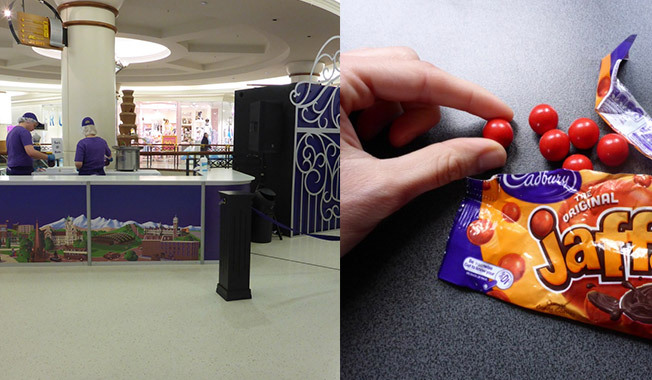 In a local mall, they set up a chocolate fountain and mini-carnival games for children, but there were more extravagant activities too, like the famous Jaffa Race at the end of the week. Jaffas are balls of dark chocolate coated in an orange candy shell. 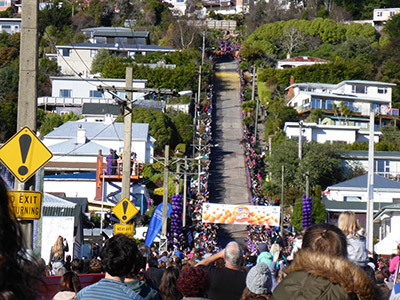 Each year at the end of the carnival, Cadbury rolls a total of 75,000 Jaffas down Baldwin Street, which is the steepest street in the world and located right here in Dunedin. This year, there were three races with 25,000 Jaffas each, and each race had specially coloured Jaffas to represent different charities. Cadbury numbers all the Jaffas, and people can purchase tickets representing the Jaffas. The proceeds go to charity, but the people with tickets for the first 5 Jaffas to make it to the bottom of the street in each race win fabulous, chocolaty prizes.